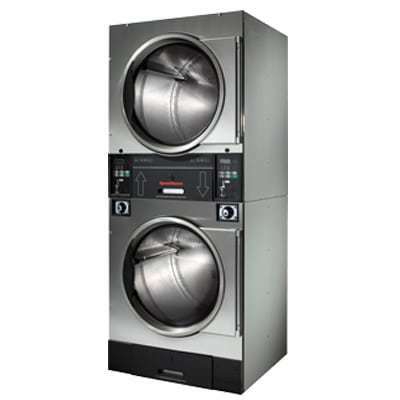 Our line of stack coin operated tumble dryers provides double the capacity of Speed Queen single pocket tumble dryers while using only half the floor space. Plus, our patented oval cylinder perforations solve a common, highly damaging problem, by allowing stray screws to pass through without doing large amounts of damage to the Speed Queen industrial tumble dryer’s sweep sheets. Available in 30 and 45 lb capacities.